From Thich Nhat Hanh, the venerable Vietnamese monk who strives to live and spread the teachings of Siddartha Gautama, I’ve learned this simple lesson: There should be no coming, no going, just being. More than anything else, these past few years have reminded me how much joy can be found in being alone. There is a major difference in loneliness and aloneness. Being lonely is an emotional state, being alone is a philosophical state. One can be alone without an attachment to any particular emotion, or even to no emotion at all. I used to read stories about people who traveled into the wilderness, or who went off to some retreat in a secluded monastery, etc, to be alone. To contemplate who they were, why they were, where they spiritually came from, how inexplicably they came into existence, what it meant to be conscious, whether or not there truly is a self, what it means to be alive, what it means to die, and so many more deep philosophical questions. When I was much younger, I spent a lot of time alone outside, in the woods, wandering. I’d turn over rocks to investigate what was underneath. I’d lean in close to flowers to find out if they had a scent and to see what they looked like on the inside. I’d touch trees to discover what their bark felt like and wondered if they could feel me too. I’d walk along the creek and watch the water trickle by and reach down to touch its coldness, and try to find any fish swimming beneath the surface. 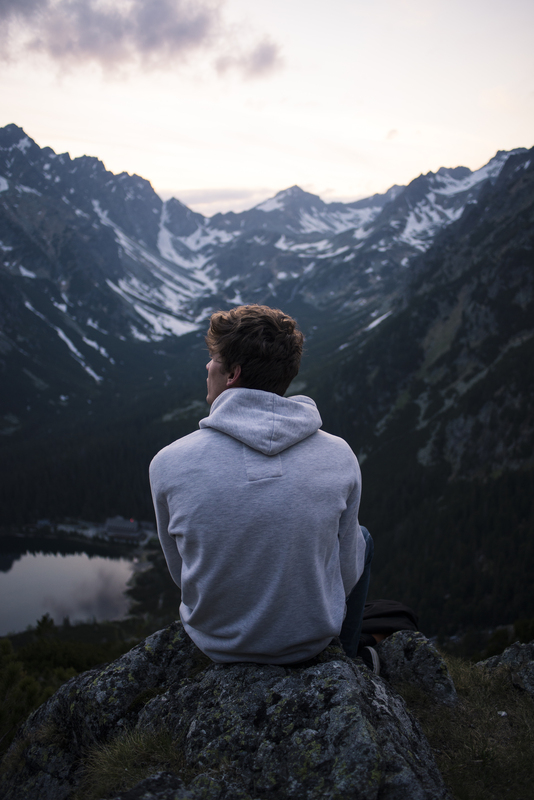 I’d sit on rocks and stare down into the valley below me, wondering curiously about everything that was me, everything that wasn’t me, and if there really was a difference between the two. Curiosity, the desire to explore and learn, the contemplation of things outside yourself and inside of you, these are the traits that I would wish to instill in any child. The distraction of a crowd or the entertainment in company is nice sometimes, but there can be true solace in being alone. A kind of solace that can shift your perception of life and reality, of virtue and morality, of purpose and meaning. It seems to me that people these days are too dependent upon constant attention and socialization. They cannot stand moments of silence or aloneness. Particularly younger generations who have grown up with online social networks… the knowledge that at least someone else is always out there, just a few short keyboard strokes away. A stark difference to my own childhood, where if I wandered off into the woods, there was no phone for me to take, no tablet, no source of human interaction or distraction at all but my own mind, and on many occasions my dog. How sad that it is to me. How sad it is that people cannot stand to be alone with themselves. I have become so confounded by youths abrasiveness towards not being constantly entertained or receiving constant attention. I’ve noticed even in myself the repetitive act of picking up my phone every time it beeps, flashes, or vibrates with some alert from a social application. Teens and even children these days are always complaining, “I’m bored!” “This is boring!” When indeed it is not the environment or situation in which they find themselves that’s boring, rather it is they who are boring, it is their chosen behavior and mindset that is boring. There is always something to do, always something that can be done, and sometimes that something is a moment of quiet contemplation, meditation, self-reflection, or perhaps even just an awareness of one’s surroundings. There is never a moment when there is literally nothing to do. The issue is the value placed on thoughts and activities. To take a page from Nhat Hanh, every tedious action can be extraordinary, if only the person could focus on it. He often writes of paying attention to the tasks we are completing, even if the task is eating an orange or washing dishes. No matter how tedious the act, it can be an immersive experience if we just try to be mindful of it. Often times we as adults don’t even need cell phones to distract us from the more insightful aspects of life. Indeed we are our own distractions, with our minds constantly being sucked into a vortex of worries, work stress, appointments that need to be made, house work that needs to be done, groceries to add to the list, places we need to be, the time we need to leave. In this way we become slaves to the coming and going of life, so much so that in our rush going through life, we actually forget to live. In his lessons, Nhat Hanh teaches us that we shouldn’t get lost in the coming and going of life, that the hurried nature of modern life and particularly of adult life is bad for us and for our kids. We’re teaching them that life is about constant tasks, constant schedules, constant distractions, constant entertainment, when it absolutely shouldn’t be. There needs to be breaks in between, moments of solitude, moments of silence, moments of solace. No arrival, no destination, just being. Take in the moment, for this moment is the only moment we exist in.